Reusable and washable, our new Custom Aquaskin Sports Bottles are absolutely the perfect choice of promotional gift for any customer. The carabiner clip funtion enables a strong clip to a bag or even bicycle for those trips out, and the 5 colour translucent colours based on a pantone colour chart give total customisation for the perfect look and feel. Why not have your Company brand name and logo on our Custom Aquaskin Sports Bottles and rest assured that your branding and name will be recognised. 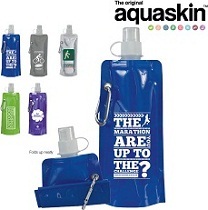 For a FREE QUOTE, please fill in the form regarding our Custom Aquaskin Sports Bottles and we'll be able to help you. Why not check out our other related promotional Gifts?